RAF Red Arrows Hawk crashes, pilots ejected. March 20, 2018 - According to BBC, a RAF Red Arrows Hawk T1 jet has crashed flying out from RAF Valley in Wales. The mishap occurred at approx. 1:30 pm. UK MoD confirmed that two officers were on board the aircraft, a pilot and an engineer. A subsequent statement reported the death of the technician. It is with great sadness that the Ministry of Defence must confirm the death of an engineer from the RAF Aerobatics Team (the Red Arrows) in a tragic accident today. The serviceman's family have been informed and have asked for a period of grace before further details are released. The pilot of the aircraft survived the incident and is currently receiving medical care. 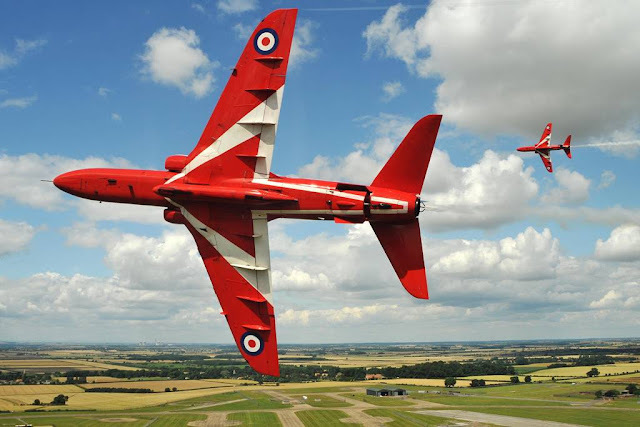 The Red Arrows aerobatic team is based at RAF Scampton in Lincolnshire, but often it trains in other air bases. RAF Valley on Anglesey is home to No 4 Flying Training School, responsible for training the UK's next generation of world-class fighter pilots. Aircrew are also trained at RAF Valley for mountain and maritime operations throughout the world.